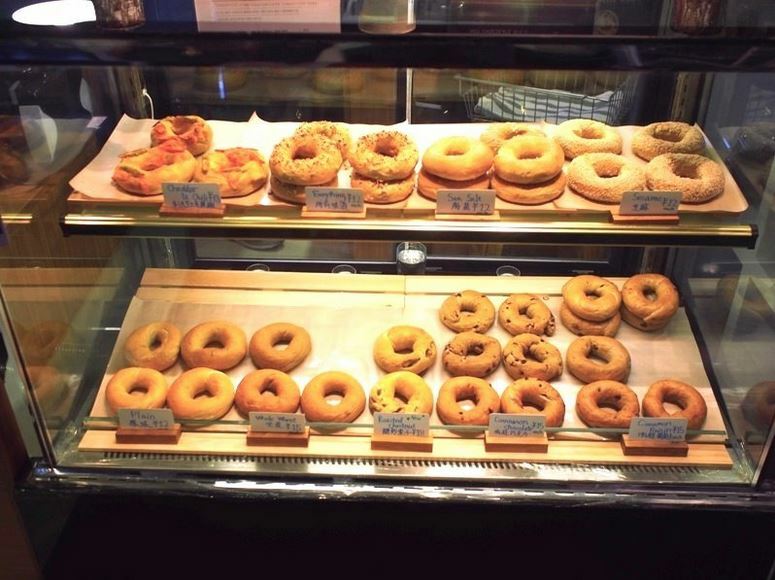 Tucked away on the first floor of the greying and grim FX Hotel just south of Liangmaqiao, The Daily Bagel hopes to inject a little bit of life into the building, if not some morning coffee and a chewy bagel into its patrons. The menu is as simple as you’d expect and hope (given reduced brain activity any time before 9am); either opt for a bagel to go from the glass-fronted counter – plain, whole wheat, roasted chestnut, cinnamon chocolate, cinnamon raisin, sesame, sea salt, cheddar and chili, and “everything” (RMB 12-18) – or get a little fancier and soup up with anything from cream cheese or butter (RMB 22) to brisket with Russian dressing (RMB 50). To test the kitchen best without having to eat 10 different bagels, the reporter opted for an everything bagel as well as a salmon and cream cheese bagel for something a little easier on the heart (RMB 38). 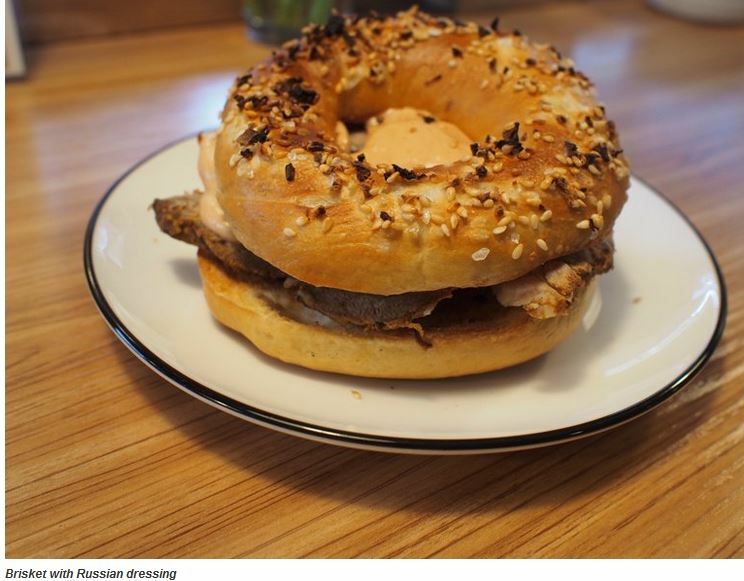 The Russian dressing turned out to be akin to a spicier rendition of McDonald’s Big Mac secret sauce, which gets no complaints from me, and complemented the big chunks of flavorful beef and the crunchiness of the sea salt, sesame, and onion on the toasted casing. If the reporter had one bone to pick, it would be that the hole-to-bagel ratio was a little big which made keeping the sauce in the bagel (and not splooging all over your hands) more of an effort than appropriate for the hour, or for at a desk. 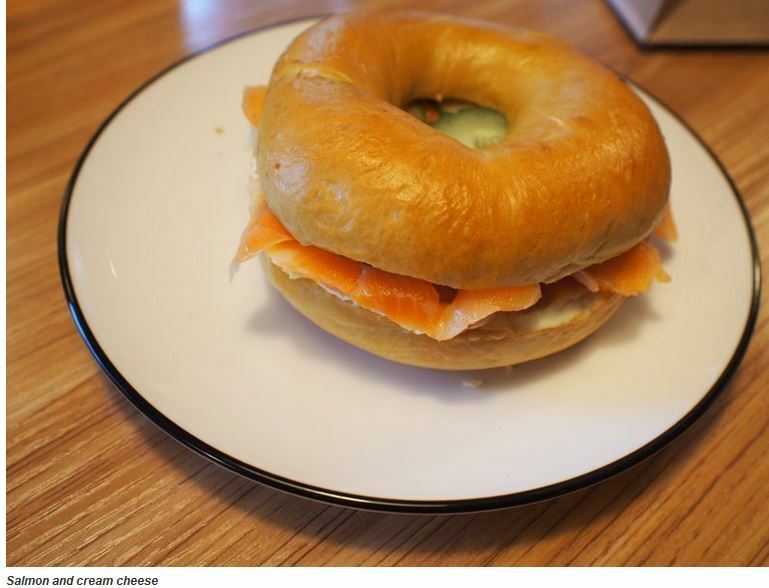 The salmon and cream cheese was, well, salmon and cream cheese, notable for its fresh ingredients assembled with care. There’s counter space and a couple of tables if you want to readjust to consciousness but I expect most customers will be making a quick dash on their way to work, which will only be aided by the strong coffees on hand, ranging from a 18 kuai espresso to a 28 kuai mocha. The staff were friendly and extremely proficient in English, a fact that I encountered via the abashed means of remarking that a couple of the bagels didn’t seem so fresh, to which the lady behind the counter politely informed me that the bagels go out warm earlier in the morning (you can arrange for delivery). Learnt my lesson there. While not in the best location for heavy footfall or the most picturesque spot to want to eat, The Daily Bagel provides a no-mess and hassle-free option for anyone looking for the comforts of a quick bagel breakfast, which a small luxury that sometimes just can’t be beat but which can be oddly elusive in Beijing.